Dog parks may offer suitable exercise and socialization for some dogs, but they also promote unwanted behavior like jumping up on people, blowing off recall cues, pulling on leash to enter the park, and mobbing or bullying other dogs. They also may be stressful and dangerous for dogs and their people. All too often, dogs who are actually quite friendly do not thrive in the dog-park environment. I generally encourage my clients to be choosy about who their dogs socialize with. Maybe it’s like human parents, who prefer their children not to necessarily have the most friends, but the best friends, who help them to be happy and reach their full potential. So, how do you choose an appropriate playdate playmate for your pooch? Go for similar play styles when pairing up dogs. Photography ©petographer | Alamy Stock Photo. While play is a topic worthy of its own article (or book! ), there are a few rather easy-to-identify play styles. If you put dogs with incompatible play styles together, you’ll often get some sort of conflict. Some dogs are specialists, preferring only one particular style, while others tend to be social butterflies and are much more tolerant of diverse play styles. It’s always best to find playmates who like to play the way your dog plays. The chaser: These dogs like to chase and be chased. Some dogs actually only like chasing, and will get really upset if they are chased by other dogs. The cooperative player: This dog likes tugging on a long rope toy with another dog. 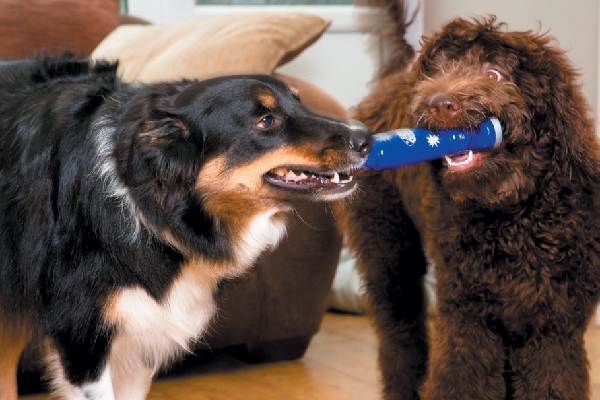 In dogs who are not cooperative players, toys in a social environment may increase the level of arousal and the likelihood of resource guarding. I generally only allow cooperative play between familiar dogs or dogs I know to be solid, well-established cooperative players. The wrestler: This dog spends a lot of time rolling around on the ground, often making insanely weird grunting noises. They sometimes make what I call “bitey face” or “clacky mouth,” where there is a lot of open-mouthed contact to the face, jowls, and neck. The tackler: This is a steamroller dog who comes on strong. These dogs like to jump up and make a lot of physical contact, and they do a lot of body-slamming in play. Tacklers tend not to be well-received by non-tacklers, so you’ll need to supervise, even when two tacklers are put together, so that arousal does not escalate to the point where play becomes aggression. What you often find is that a chaser does not take well to being tackled, and a wrestler may be totally uninterested in chasing. Cooperative players think clacky mouth is ridiculous, and pretty much everyone but tacklers wonders what the appeal in a tackler could possibly be. While size certainly does play a part in selecting appropriate playmates, I’ve seen great clacky-mouth or even tackling play between dogs who are dramatically different in size. When very large dogs play with very small dogs, you always want to keep an eye on the larger dog to ensure that he is doing what trainers call “self-handicapping,” whereby the stronger or more athletic participant doesn’t use his full strength or speed to make himself a more appealing playmate. Perhaps you remember your dad “letting you win” at arm wrestling when he could have beaten you with little challenge. It’s never fun to play if you lose all the time! 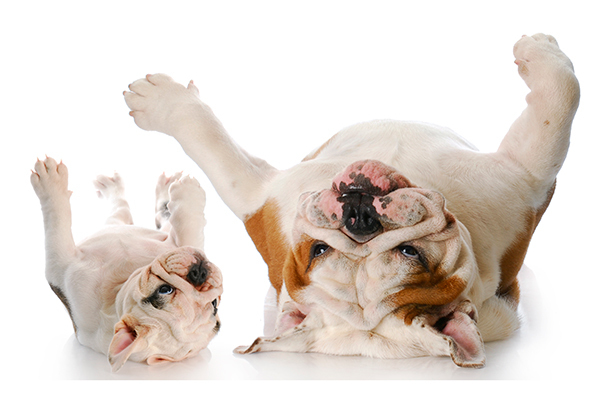 Try to pair up dogs of similar ages — a puppy and a senior dog might not be a good match. Photography ©WilleeCole | iStock / Getty Images Plus. Generally, it is best to select a playmate of a similar age to your dog. Puppies and adolescents tend to be very annoying to senior dogs — I often see young dogs bullying seniors and their owners looking baffled when the senior dog snaps and lets them know he’s had enough. While some seniors might tolerate tackling and chasing shenanigans, many won’t— and they shouldn’t be forced to. Far better to find your dog a playmate who not only tolerates, but loves his stamina and style! I always prefer, whenever possible, to separate dogs into pairs. If there are three dogs, I often see one dog exhibiting “odd man out” symptoms, frustrated because the other two are just slightly more compatible and are relatively uninterested in his play advances. It’s not unheard of to see two dogs team up and pick on the third dog by barking, rushing in and nipping a leg, or muzzle punching. Now, get out there and find a playmate! Tell us: How do you find a good playmate for your dog? Thumbnail: Photography ©fotokostic | Getty Images. The post 4 Tips for Finding a Good Playmate for Your Dog appeared first on Dogster.